In my family, fish was always hailed as a ‘brain food’. Now we know that there is so much more to these delicious and nutritious gifts from the deep. The beauty of fish is that it is not only tasty, but it’s also a high-quality, complete protein without the bad cholesterol or the saturate fat normally associated with complete proteins (such as animal products like red meat and diary). In fact, it is the type of fat in fish that gives it such a strong reputation for being so incredibly good for us. Fish oil contains an essential fatty acid commonly known as omega-3. It is essential because our body cannot produce it so it needs to be obtain from our diet, and it is essential to all the tissues in the body. Omega-3 keeps your blood pressure at a healthy level and reduces fat buildup in the arteries from “bad” LDL cholesterol in your blood. For both these reasons, it reduces your risk of cardiovascular disease, the biggest killer in the UK. The British Heart Foundation says eating oily fish can help reduce the risk of heart disease and improve your chances of survival following a heart attack. 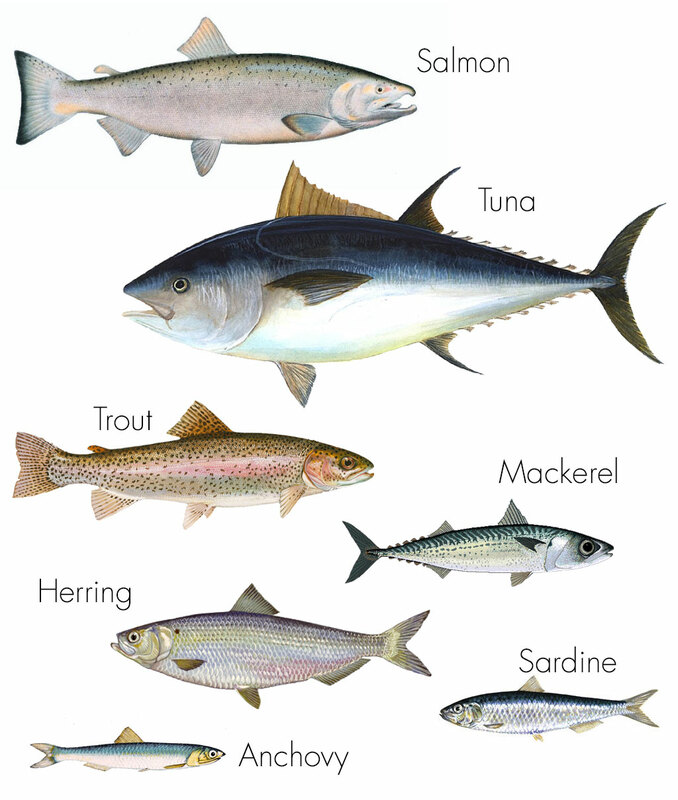 Salmon, trout, tuna (not canned), mackerel, sardines, herring and anchovies are all oily fish. Oily fish have oil in their tissues and in the belly cavity around their gut. Their fillets can contain up to 30% of oil as opposed to whitefish (like cod), where their oil is mostly found in their liver. Interest in the health benefits of oily fish started when researchers noticed that Eskimos, who mainly ate oily fish, had fewer heart problems despite their high fat diet. Omega-3 fats were identified as the factors in their diets that appeared to offer so many health benefits. Since then, the health benefits of omega-3 have been researched and we now know why these essential fatty acids help keep our body, and cells, healthy. Omega-3 has a number of jobs in the body, including helping with cell structure and the formation of cell membranes, circulating oxygen and reducing blood clotting. It reduces and manages inflammatory conditions such as arthritis. It is also said to help protect against prostate cancer, some skin conditions, diabetes and damage to brain cells (helping prevent dementia and Alzheimer’s). Omega-3 are essential fats for children because they help with brain development. Some studies have even found that omega-3 consumption can help soothe symptoms of ADHD. It is also believed the unique mix of protein, omega-3 and antioxidants in fish like salmon nourishes your skin, reducing wrinkles, and keeps your hair shiny. Fish meat also breaks down a lot easier in your gut (as opposed to red meat), making it easier on your digestive system. It’s also a good source antioxidants vitamin A, selenium and zinc, as well as some B vitamins (riboflavin) and vitamin D. Oily fish may be higher in calories and fat than white fish, but that’s because of the extra oil. So don’t be put off, this oil is what makes oily fish so good for you. Baked, grilled, barbequed or lightly fried (not deep fried!! ), fish forms an important part of our daily diet.